For what do you feel reverence? Maybe even total and unmitigated reverence? I feel reverence for the perfect over-brewed bittersweet cup of Jasmine tea, the kind any connoisseur would gag on. (Of course I googled how to spell “connoisseur.” But now I feel reverence for those who can spell it correctly without googling). What is exhilarating to me, might be boring to you, and so too the reverse. 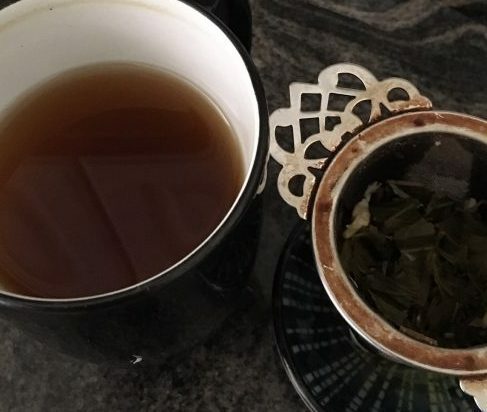 Writing with this Jasmine tea beside me is like having a harsh and loving editor on hand– one who both assures you you are awesome and you can do anything, and cuts out everything that is not that from your page. The tea is also a vitalizing force (YOU CALL IT CAFFEINE, I call it magic), a rich earth brown. It also connects me to a many cultures across the world where tea is taken Very Seriously. Many good writing teachers have issued a caveat that you should not build a dependency between your creativity and any beverage (it’s a crutch and potential obstacle). BUT I SAY, HAVE YOU HAD THIS PARTICULAR CUP? And also I have such reverence for the sunrise stabbing between buildings on my city block, and the hefty magnolias here and gone. Oh, and for my baby’s abject commitment to having inedible plastic in her mouth. Sometimes if we start with what talking about what we love unabashedly, everything else comes spilling out. That’s one power of reverence. What about you? For what do you feel reverence? Can you write that feeling, and see where it takes you? Nothing is too mundane to begin with. My four year-old son often admires his own ability to burp. Whose to say that is not a form of bodily genius? If possible, put yourself in the presence of something that makes you feel reverence. Set a timer, if you like to have constraints. Check in with your body first– what does this really feel like, and where do I feel it? Then, let it rip on the page without stopping: can you describe this thing or experience that, to you, is kind of holy? What associations does it hold for you? What memories does it bring up? We won’t fault you for burping, or singing. We won’t fault you for loving your Carmel Frappe, or the Jordans you had in middle school. And if you want some feedback how to turn your writing on something you love into something more, contact us.